Fig. 7. 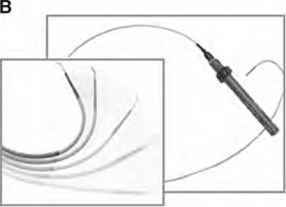 A typical radiofrequency (RF) catheter creates a lesion about 4 to 5 mm in diameter. 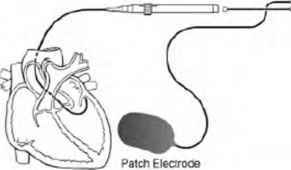 The scar is large enough to ablate critical electrical circuits, yet small enough to prevent any significant damage to the heart. Typically, radiofrequency ablation heats tissue 1-2 mm deep. (A) The radiofrequency generator is able to instantaneously control the amount of energy delivered. One type of generator circulates a cooling liquid around the tip of the catheter so that the temperature of the tip can be controlled; this generator can minimize energy without causing fluid to boil. (B) Deflectable tip catheters allow steering of the catheter tip to a position at the critical site to be ablated. Today, the majority of ablations are performed with typical electrode catheters. Usually, radiofrequency energy is delivered through the same electrode used for mapping. Radiofrequency ablation catheters use energy similar to electrocautery. Radiofrequency energy heats the catheter tip-tissue interface, with resultant injury to the underlying tissue. Some advantages of radiofrequency ablation are: (1) small amounts of energy are required; (2) output power is easily controlled; (3) it creates small, homogeneous lesions; and/or (4) it does not cause dangerous/unpleasant stimulation or sensory effects. The amount of heating produced during radiofrequency ablation at the electrode tip can result in local blood boiling. To avoid this problem, one type of ablation catheter controls the temperature at the tip by using a cooling fluid. There are numerous companies working on competing designs of such technologies. Thus, such cardiovascular device companies continue to improve all design aspects of these catheter systems (i.e., improving the ease of positioning of the distal electrode). Other methods to focally destroy cells endocardially are also emerging: (1) laser energy has been used to destroy arrhyth-mogenic tissue via a cautery-type process; (2) microwave energy has been investigated as a possible energy source; and (3) cryoablation freezes tissue at the catheter tip to destroy muscle fibers without harming connective tissues (Table 2). 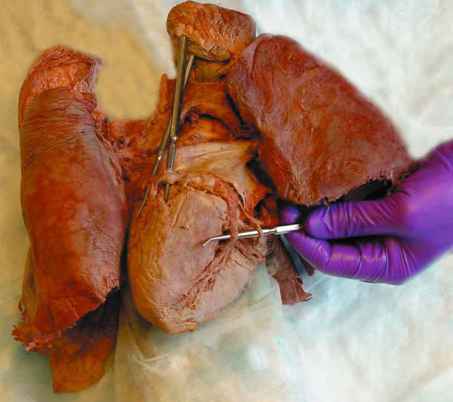 Visualization of the exact site where the lesion is to be created remains an area of intense research; advanced echocardiography systems as well as specialized catheters with built-in imaging possibilities are aggressively being pursued (16-18). As described in Section 4.1., drug-coated eluting stents have made a major impact on the field of interventional cardiology. There is little doubt that such combined approaches that incorporate pharmaceutics with implantable devices will continue to expand as a means to improve clinical management of the heart. For example, steroid-eluting pacing leads have been on the market for years to manage acute inflammation associated with lead implantation (see Chapter 25). Steroid-elution technology is considered to reduce inflammation; by eluting a steroid at the lead tip, leads are designed to reduce the typical tissue inflammation. Reduced inflammation allows lower pacing system energy requirements. For example, by reducing tissue inflammation, it has been described that such leads allow the use of lower electrical settings for low, stable, acute, and chronic energy outputs. Device and battery technologies both continue to decrease in size and exhibit improved efficiencies. This in turn creates increasing possibilities for novel approaches for long-term assessment of various physiological parameters from unique aspects of the cardiovascular system. One such device, the Medtronic Chronicle®, is intended to sense and continuously collect unique and valuable information (e.g., intracardiac pressures, heart rate, and physical activity) from a sensor placed directly in the heart's chamber. A patient can then periodically download this information to a home-based device that transmits this critical physiological data securely over the Internet to the Medtronic Patient Management Network. Subsequently, physicians can access the network via a controlled Website at any time and review screens that present summaries from the latest downloads, trend information, or detailed records from specified times or problem episodes. The Chronicle Patient Management System is currently undergoing investigational trials in the United States and Europe and is not yet approved for commercial sale. Other types of implantable sensors that will likely be available in the future include those for blood chemistries (respiratory gases, pH, heparin, polyanions, etc. ), flows, cardiac outputs, temperatures, glucose levels, drug levels, or other physiological data.